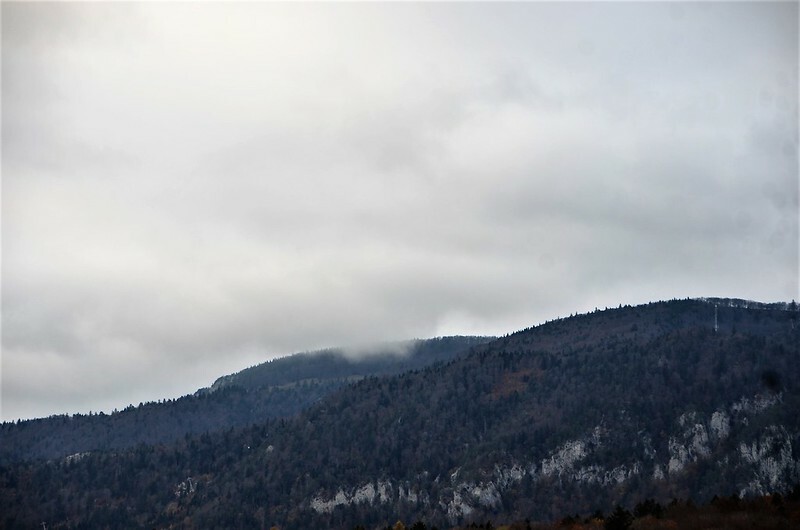 Another dull morning, although this photo was yesterday morning of a low cloud on the Jura, but today is no different. Now and again, to enhance the atmosphere, there is a crow cawing – so where is Alfred Hitchcock or even Vincent Price. They would both enjoy the atmosphere. I decided to take a wheelie in my chair yesterday afternoon and equipped myself with gloves and a warm jacket with scarf to keep my neck warm. I was surprised that our temperatures were climbing and I only needed the gloves on the home stretch. Again a record is being broken with the warmest November days for some years. 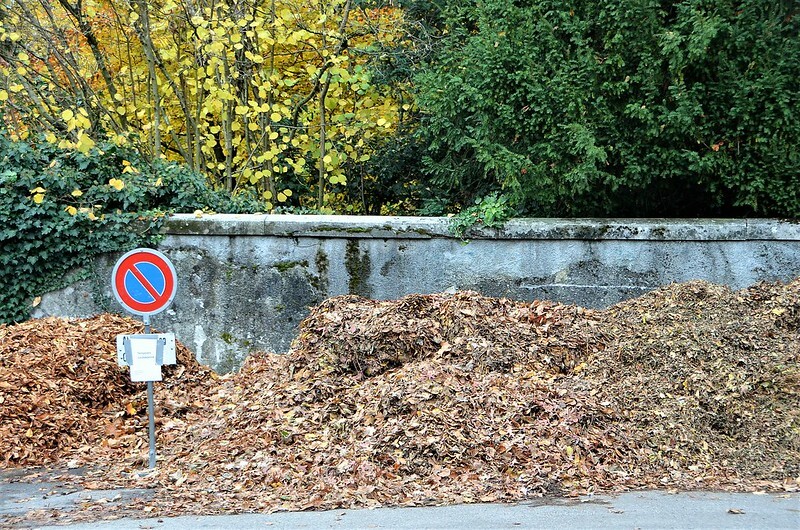 However the leaves are collecting and our local workers decided to pile them in one place, against the cemetery wall. They leave no leaf unturned it seems. Since they have these blowing devices they run amok with the new toy. Yesterday I saw a synchronised column of three men all blowing the leaves away. When the winter snows arrive they collect the snow and tip it into the local river. I hope they will not be doing the same with the leaves. 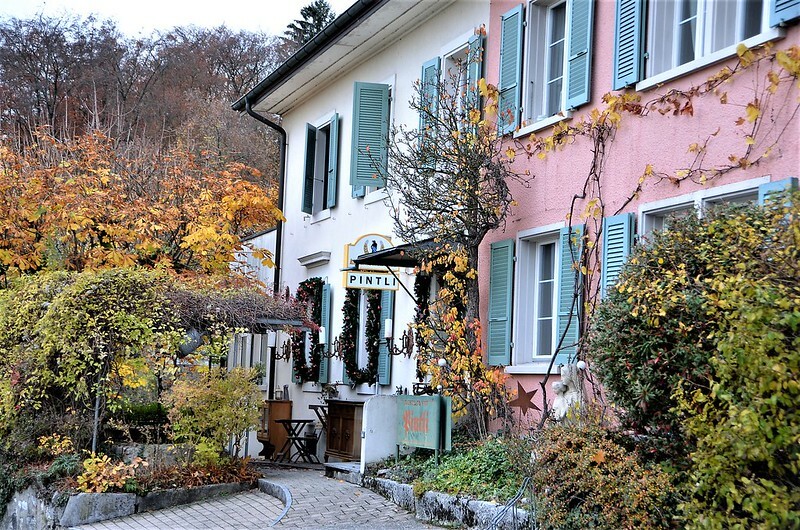 I wheeled past the village restaurant which really was looking good with the Autumn coloured trees in the garden and the entrance. We would often sit outside on the terrace in the summer for a drink when walking past, but these days Mr. Swiss no longer walks without his stick and would not manage to climb the hill to reach the restaurant and I am confined to my wheelchair for longer stretches. We were only saying yesterday that the only opportunity we have to go out together is in the car, and we used to take walks together, sort of golden oldie hand in hand, in the past. Now we are debating about a visit to the doc to discover how we will handle the future when we are both handicapped with walking. I have my wheelchair, but have to do my journeys solo. Shopping is still possible, but I have a trolley to cling to. It is the future that has so many open questions. When I was younger I had no idea what getting older would mean. I paid a visit to the farm on my way to see how my friends the chickens were managing. Everything seemed under control under the watchful eyes of the rooster. He might be ugly on human terms, but to a hen it is all she has, so I suppose she makes the most of it. There is a guy I often see at the farm whose job, at least one of them, is collecting eggs, so everything seems to be running its normal daily routine. I also saw a few cows out on the pasture. Throughout the summer they had been kept in the barn during the day due to the heat, but now they are having one of their last flings outside before the cold weather arrives, although there are even one or two cows in the Bernese Overland that have been given skis. I once saw it on our Swiss TV, but more a novelty. And now I have something more exciting to do, like hoovering and mopping and getting ready to be let out for my shopping trip. Oh what an excitement. The week-end meals are planned and this evening No. 1 son will again be at a pop concert in town, so a romantic candlelight evening meal with Mr. and Mrs. Swiss I suppose, although afterwards he switches on the TV and I retire to my computer. The romance of golden oldie life. 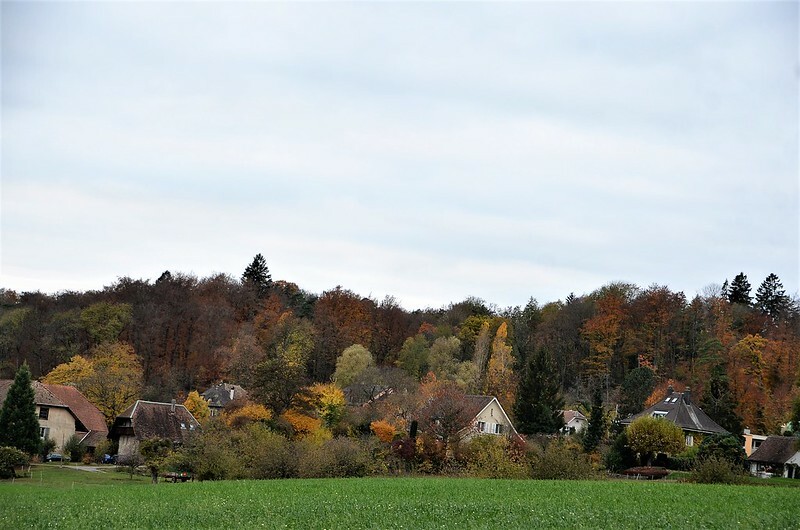 it is not so much of a dull moment but an adorable view of nature.The autumn is so amazing. Autumn is looking very pretty. The restaurant looks lovely. The pink building is part of it, too? 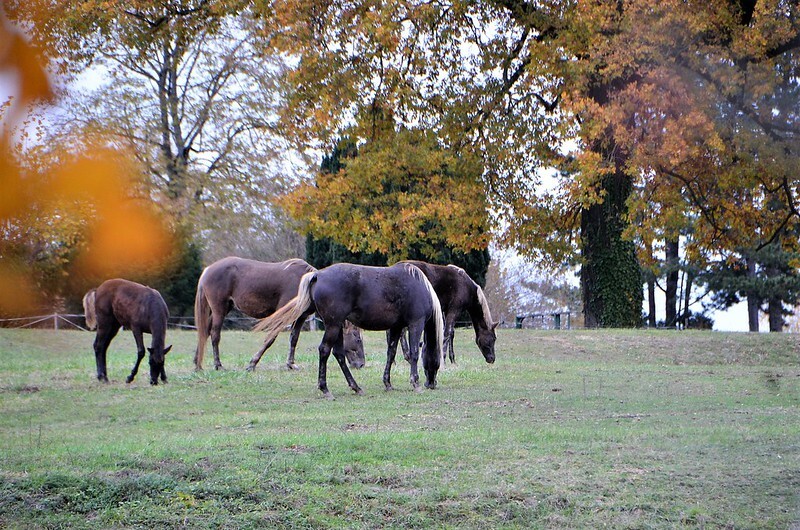 I LOVE the farm pictures. That first picture got my attention. I know it is only a cloud, but for an instant, it reminded me of smoke. It is a sad day here today. As I mentioned earlier, the fires are bad. Paradise burned last night. I once saw a fire like that from a distance in Portugal. It was burning for the two weeks we were on holiday, and probably continued afterwards. The climates of Portugal are similar to our, so they likely get fires like we do. Some of their trees have similar ways of surviving fire, so are adapted to the same sorts of ecosystems. 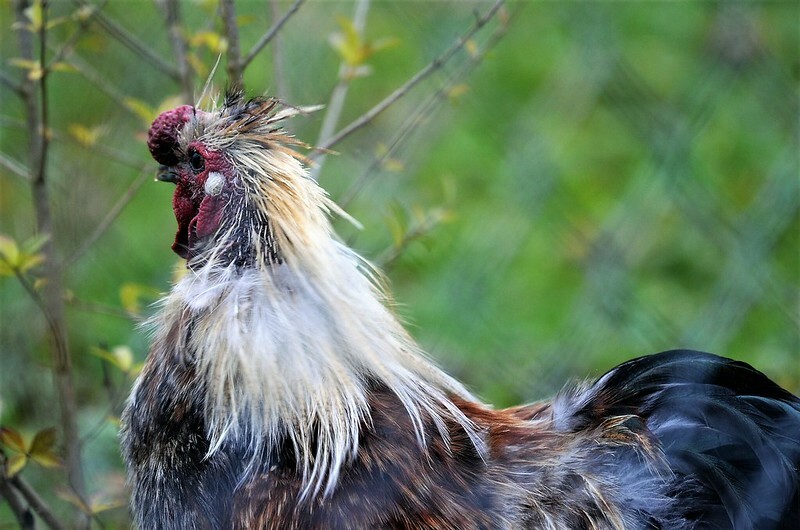 Very handsome chicken (rooster?) 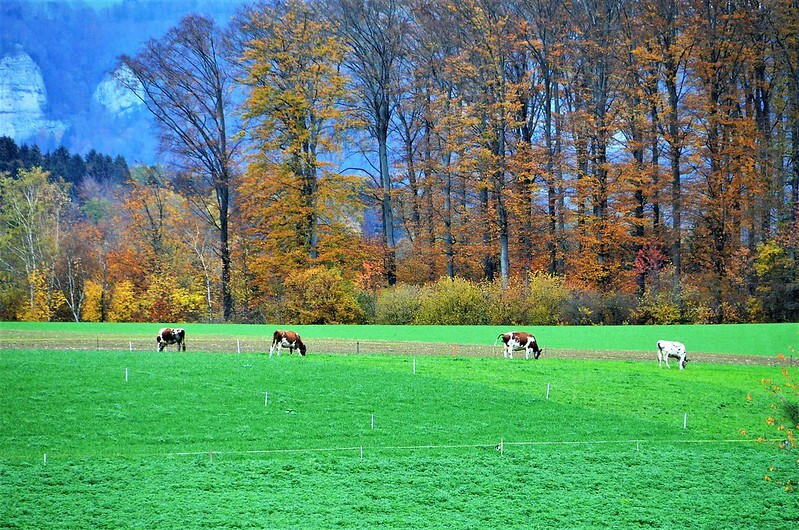 and the woods in late autumn and the green grass. It’s the rooster. Our woods are fantastic at the moment and the fields that have been harvested are now producing a lot of greenery.